Bugleweed is a marshland native and native to Europe that was once grown by the colonists in the U.S. for its medicinal properties. Bugleweed has been used by modern herbalists to treat hyperthyroidism and to regulate an overactive thyroid gland. It has also been used to tone the heart and stabilize rapid or irregular heartbeat, relieving nervous palpitations and strengthening the heartbeat. It is believed to be particularly helpful in treating Graves' disease when there is cardiac involvement, especially where there are symptoms of a racing heart, shaking and tightness of breathing. Many modern medicine practitioners have often used Bugleweed for treating heart ailments and is considered to be among the most placid and best natural narcotics that exists today. Bugleweed is an effective treatment for nervousness, insomnia, PMS, tension and pain in the breast (mastodynia), nosebleeds, excessive menstruation and blood in the urine. Because of its diuretic properties, the tincture is prescribed for healing tuberculosis, coughs, chronic inflammation of the lungs and all chest congestive diseases, as well as bleeding from the lungs. Lastly, Bugleweed is helpful for weaning babies because it suppresses the production of breast milk. Bugleweed is one of the most effective herbal remedies for thyroid disorders. Bugleweed tincture is used to lower the overproduction of thyroid hormones and is, therefore, very effective in the prevention of the hyperthyroidism, or the worsening of this affliction, especially in the early stages of the disease. It is commonly used today for treating Graves' disease symptoms such as rapid pulse, exophthalmic goiter, weight loss, sensitivity to heat, excessive sweating, fatigue, bulging eyes and enlarged thyroid. Lemon Balm is often included with this herb because the studies showed its ability to block the action of thyroid-stimulating antibodies found in Graves' disease. Studies suggest that an ingredient of Bugleweed herbal extracts reduces levels of TSH (the hormone that stimulates the thyroid gland) and by impairing thyroid hormone synthesis. Taking bugleweed and avoiding seafood and other foods that contain iodine is very helpful to people with overactive thyroid problems. Bugleweed has been an effective remedy for tuberculosis accompanied by palpitations, tenderness in the chest as well as cardiac debility. Lycopus virginicus, or Bugleweed, is also considered to be an effective remedy for exophthalmia (protrusion of the eyeball) owing the condition to cardiac ailments, as well it provides relief from chaotic actions of the heart. It is particularly effective cardiac debility, whether caused by excessive stress or rheumatic ailments, or to the use of drugs or stimulants that affect the heart, for instance, tobacco and like stimulants. 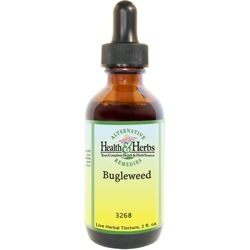 Bugleweed tincture slows down the rapid unusual heartbeat and makes it fuller and normal. It is safely used where palpitations occur that are of nervous origin, and Bugleweed is said to aid a weak heart where there associated water buildup in the body. Bugleweed has a hypoglycemic action that lowers blood sugar levels. The extract has been useful for pain and to help to contract the mucous membrane tissue that can be helpful for those with Type 2 diabetes. It is an excellent tonic for the whole system, which settles the stomach and normalizes the appetite. Bugleweed reduces irritation to the intestine from diarrhea and stops diarrhea. It has been noted that Bugleweed works on all visceral glands which include the pancreas, and so it is helpful treating indigestion, dyspepsia, and conditions such as gastritis and enteritis. Bugleweed tinctures are an effective herbal remedy for lowering blood pressure levels as well as regulating nervous anxiety and irritability. Bugleweed is a herb that is able to offer a cooling, soothing effect and this helps to relieve tension in the nerves. As a result, muscles get relaxed and a person can get a good nights sleep. Some forms of panic attack and anti-anxiety medications can actually lead to dependency, Bugleweed is a safe alternative to these medications, without the side-effects and possibility of addiction. Bugleweed herbal supplement also decreases the production of pituitary gland hormone known as prolactin 5, an elevated level which is associated with female reproductive difficulties, and the breast pain caused by premenstrual syndrome (mastodynia) and enlarged breasts in men (gynecomastia). It reduces the reproductive hormones associated with the menstrual cycle and also reduces prolactin (the hormone that triggers the production of breast milk). The tincture is also prescribed cure coughs and bleeding of the lungs. As a natural sedative and cough reliever, it eases nervous coughs. It expels mucus and pus from the lungs due to old, chronic, dry coughs, and it is recognized as a natural tuberculosis remedy. Bugleweed is a very good substitute for Foxglove to treat such conditions as it helps pacify chronic coughs and heal fevers, plethora (a gloomy condition caused by an augmentation in the blood). Additionally, Bugleweed is used to reduce hemorrhoids, to control or nosebleeds and for excessive menstruation or blood in the urine. Ingredients: Bugleweed, Structured Water, 20% Alcohol. Non-Alcohol: Bugleweed, Structured Water, and Vegetable Glycerin. Contraindications: Pregnant and nursing women should not use Bugleweed Herbal Supplement, nor should those who have hypothyroidism. It is recommended that Bugleweed is to be used for specific conditions only in consultation with a health care practitioner. Caution is advised in patients with diabetes or hypoglycemia, and in those taking drugs, herbs or supplements that affect blood sugar levels. Blood glucose may need to be monitored by a qualified healthcare professional and medication adjustments may be necessary. Bugleweed may raise or lower blood pressure. Again, caution is advised for those taking herbs, drugs or supplements that affect blood pressure. Drowsiness or sedation may occur use caution if driving or operating heavy machinery. Use with caution for those on pharmaceutical sedatives.